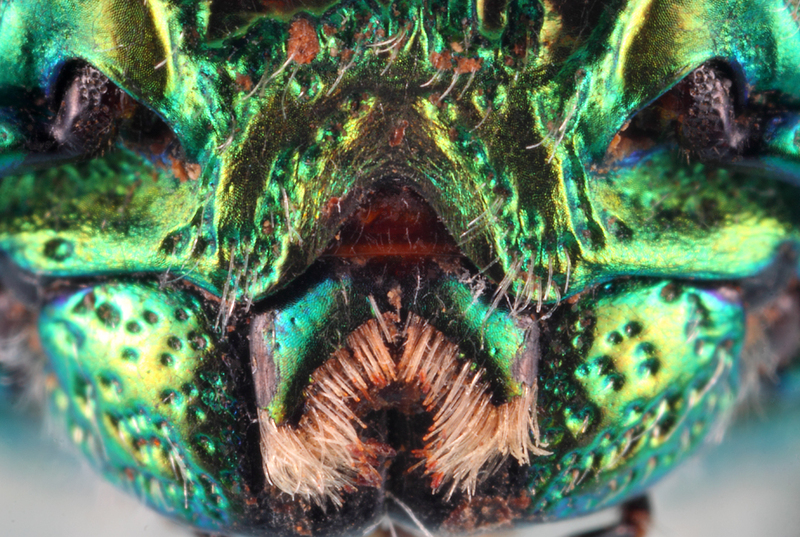 In North America, beetles in the family Buprestidae are commonly referred to as “metallic woodboring beetles.” This may be a perfectly adequate name—accurate and descriptive, but it’s also a bit dry and not terribly imaginative. Personally, I much prefer the moniker given to these beetles by the rest of the world—”jewel beetles!” No other name better captures the essence of these dazzling insects—brilliant, sparkling, even gaudy in coloration and with the most exquisite of surface sculptures, and no other group of buprestids better typifies jewel beetles at their most extreme than the great tribe Chrysochroini—the ‘‘classic’’ jewel beetles! 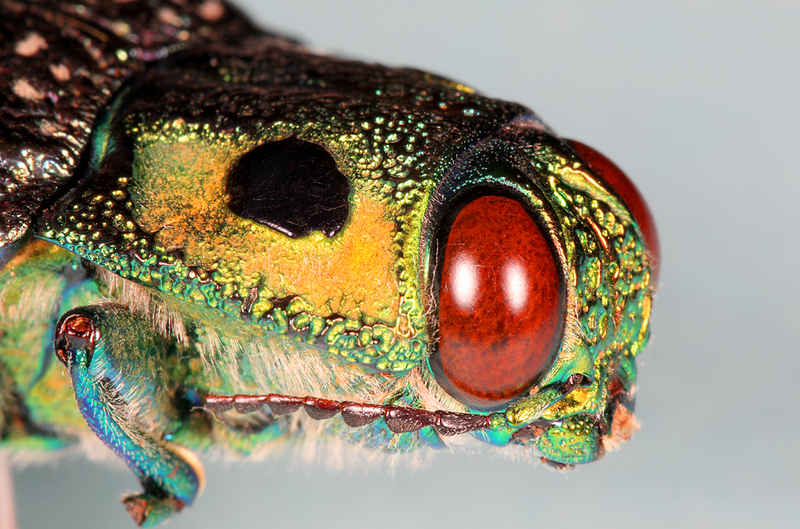 Members of this tribe are found throughout the world (Chalcophora, Texania, Lampetis and Dicerca are the most familiar North American genera) but reach their zenith in the ancient rainforests of Africa and southeast Asia—big, beautiful beetles with screaming iridescence of green, red, yellow and blue. Living jewels! I have a fair number of chalcophorines in my collection, and among the more recent acquisitions is this fine specimen of the species Madecassia rothschildi. One of a pair of specimens given to me by friend and world buprestid-expert Chuck Bellamy, this larger of the two measures a whopping 45 mm in length (that’s almost 2 inches, folks! ), surely near the top end of the range for this genus and paling only against such giants as Euchroma and Megaloxantha. 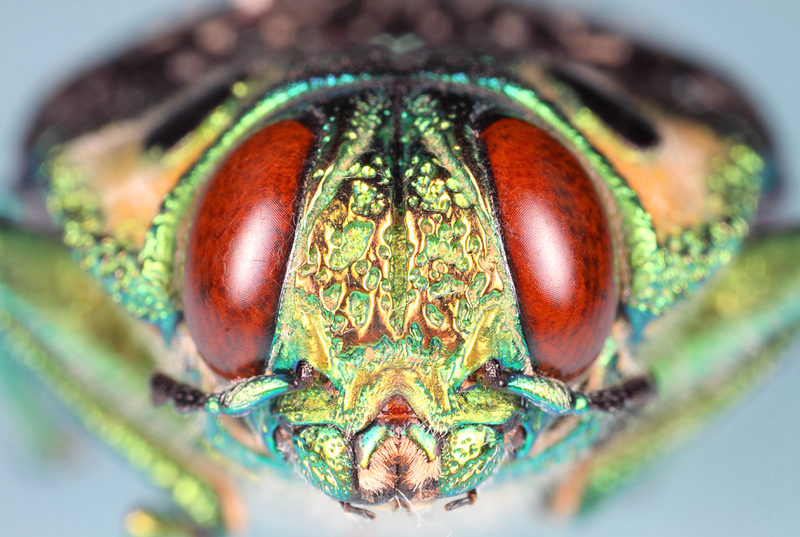 The reddish-brown eyes on a brilliant green head, turquoise legs and white-flecked, wine-colored elytra are enough to make it stand out, but it is the distinctive yellow-lime “false eyes” that made me do a double-take when I first laid eyes on them after opening the box. 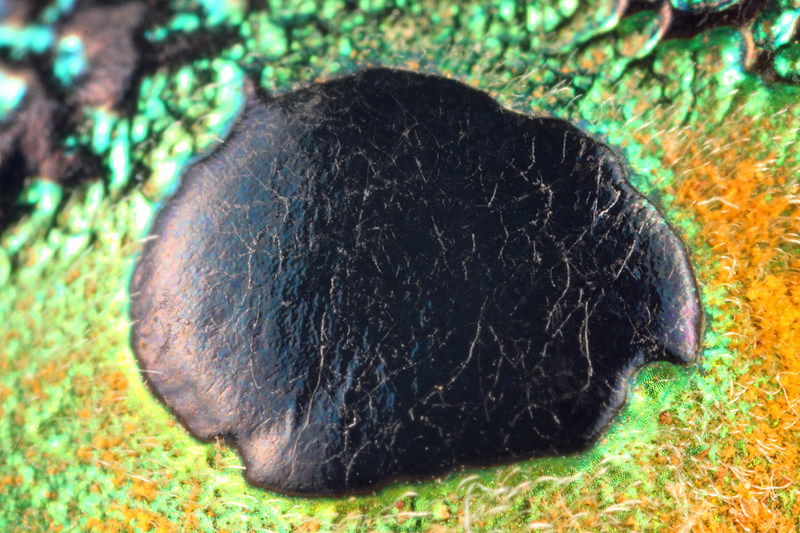 A closer look at the eye spots reveals the yellow-lime area to be densely pulverescent. Madecassia rothschildi and the two other species placed in the genus all hail from Madagascar (Bellamy 2008). This particular species must be rather common despite the well-chronicled disappearance of Madagascar’s native forests, as a quick Google search of the species name (or its older synonym, Lampropepla rothschildi) brings up a multitude of web sites for commercial insect dealers with this species in stock. The combination of its size, coloration, and availability must make it a popular item among philatelic collectors, and although I’m not a big fan of buying insects, I can understand the desire to purchase something as spectacular as this. I’ll be the first to admit that these photos aren’t nearly as striking as Gianfranco Merati‘s photos of Polybothris sumptuosa, but they do well illustrate the iridescence that is common to these beetles. 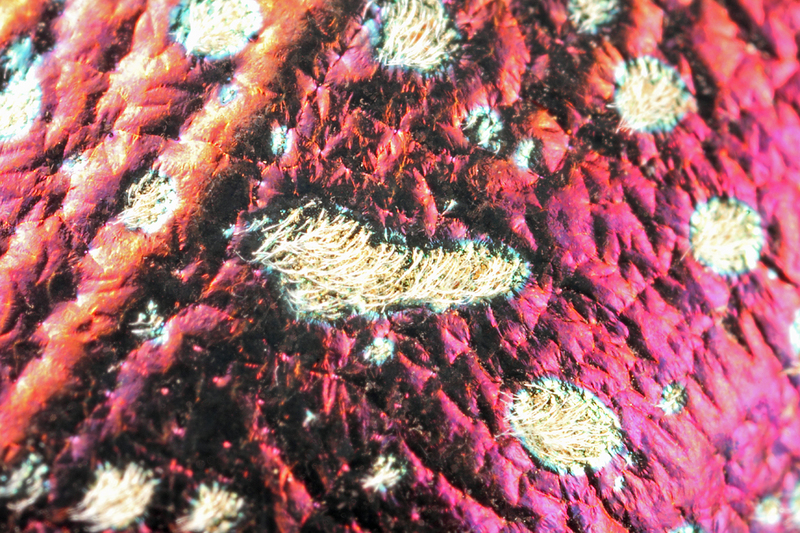 Iridescent coloration is due not to pigments in the exoskeleton, but rather the physical properties of different layers in the insect cuticle that reflect light of specific wavelengths in different directions (hence, resulting in apparent color shifts depending on the angle at which the subject is viewed). Despite its commonness, it seems that virtually nothing known about the life history of this species or the host plants that it utilizes. Records in Madagascar are all from the south (Bellamy 2006), but all other references to this species consist exclusively of catalogue listings. A large, conspicuous, abundant species such as this almost begs for ecological studies—the “eye spots” can be presumed to function in predator avoidance, but how? What is the purpose of the dense brush of hairs inside the labrum (upper lip) and next to the mandibles, and why is the labrum itself so acutely emarginated? Adults are largely reproducers, not feeders—do these structures serve some other function not related to feeding? What about the dense covering of “pits” over most of the body surfaces—presumably they contain chemoreceptors for smell, but what? Host plant volatiles? Mates? Humidity? So many questions, so few answers. Imagine the even greater paucity of knowledge that exists for its smaller, less conspicuous relatives that also make their homes in the forests of Madagascar (most of them probably not adapting as well to the man-induced changes of the past century). Congratulations to Tim Eisele, whose 13 pts not only nets him the win in Super Crop Challenge #11 but also moves him up to 2nd place in the overall standings for BitB Challenge Session #5 with 29 pts. Mr. Phidippus‘s 12 pts just missed the win but keep him in well in command atop the overall standings at 43 pts. Strong showings by Dorian Patkus (11 pts) and Dennis Haines and Roy (10 pts each) also keep them in the overall hunt with 20, 25 and 28 pts, respectively. I suspect the top spot is now a lock, but it looks like we’ve got a real battle brewing for the remaining podium spots. There will be at least one more challenge in the current challenge session, and for the first time I am considering consolation prizes to the final 2nd and 3rd podium spots as well, so everybody will want to make sure they participate in the next challenge. 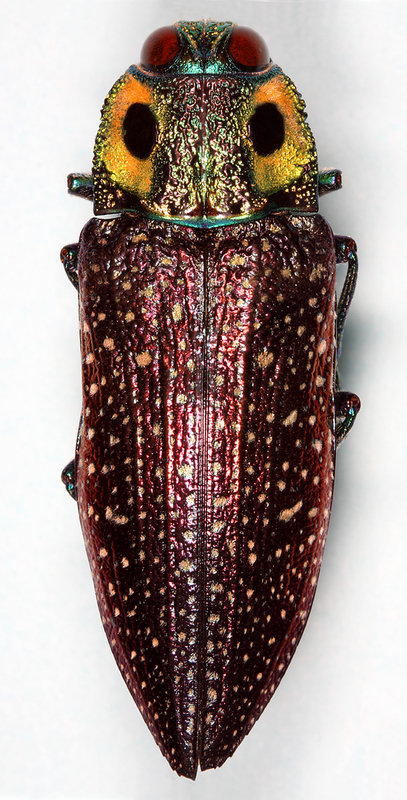 This entry was posted in Buprestidae, Coleoptera and tagged beetles, entomology, insects, jewel beetles, Madagascar, nature, science, taxonomy. Bookmark the permalink. I think your photos stand up to Merati’s quite comfortably. Thanks for this, really interesting post once again! Great read. Funny.. I actually took some pics of my M. rothschildi the other day, planning to post it as well. I forgot how much you like Bup’s too. Great bug !! Thanks for the info. I’ll be anxious to see your photos. Commercial insects are big business, but the real customer base is more in Europe and Japan – especially the latter, who view building philatelic insect collections almost as a national pastime. Not so many North Americans get into insect collections in the same way, and those that do typically have more scientific/taxonomic interests than building a collection just for the collection itself. Some commercial butterfly suppliers are now breeding some stock, but for the most part commercially available insects are wild harvested. I don’t have moral qualms about purchasing insects (unless they are endangered or have been secured illegally), but like you say it’s not much fun. It’s a difference in perspective – for philatelic collectors the insects themselves are the reason for the collection, while for me and others like me the insects are but vouchers for the scientific data (and the wealth of memories gained from time in the field). Interesting and enjoyable for a non-specialist, like myself, to read. Stunning photographs. Sher in Oregon. Thank you Sher – I appreciate the nice feedback. Gorgeous critter. What does “pulverescent” mean? Powdery; dusty; covered with very minute, powder-like scales – comes from the Latin word pulvis. “Pulverulent” is another similar term.